Data Migration – $50.00 Before we address your computer repair needs we need to backup your data; pictures, music, office documents, etc. We’ll save up to 8GB on to DVD’s or unlimited data on your external hard drive. PC Diagnostic -$50.00 Computer repair starts with finding out what the problem is. One of our techs will run a full gamut of diagnostic tests to find out exactly what is wrong with your computer. We’ll also do a virus scan to make sure you’re not infected. Factory Recovery – $100.00 If your computer seems overrun by viruses, or you simply want to start over clean, we’ve got the solution for you. We’ll format your hard drive, reinstall your operating system, install all drivers, perform all updates, optimize the operating system, and install an anti-virus software of your choice. Quickstart PC Setup – $50.00 Our most essential PC setup service. We’ll perform all the “first time startup” processes involved with setting up your new computer. Then we’ll optimize the computer by removing any unwanted and unnecessary programs, and streamlining the startup process of the computer. Lastly we’ll create your factory recovery discs, so you’ll be able to restore your computer in the event of a serious failure. Basic PC Setup – $150.00 Let us handle the installation of your new computer. We’ll unpack and connect all your pc components; keyboard, mouse, speakers, monitor, and printer. We’ll also optimize your computer for peak performance, configure your internet connection, install your anti-virus software, and make sure you’re able to access your email. Lastly we’ll create your factory recovery discs so you’ll have an insurance policy against catastrophic failure. Premium PC Setup- $200.00 This service includes everything in our Basic PC Setup plus we’ll configure a wireless router and make sure its fully secured. 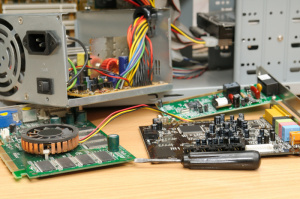 Hardware Installation – $35.00 This service will cover the installation of most hardware. Whether you need more RAM, or a new video card, we’ll install it, update any necessary drivers, and test your new hardware to ensure its performing optimally. Peripheral Installation – $35.00 Have us install and setup printer, webcam, gaming controller, or any other peripherial on your personal computer. We’ll ensure the new device is completely up to date, and working properly when we’re done. Software Installation- $25.00 Anti-Virus, iTunes, or Microsoft Office; we’ll install any software for one low price, and we’ll make sure it works. Wireless Network Setup – $75.00 One of our technicians will configure your wireless router, providing the most security possible with wireless encryption, and connect one wired PC and one wireless PC. Add $25 for each additional wireless device. Premium Network Setup – $125.00 Have a house full of electronics? We’ll get every computer, every gaming system, and any other wireless devices you’ve got laying around all working together on one wireless network. We’ll even get all your computers printing to one printer. *These services include labor only. Any required hardware, cables, or other accessories must be provided by the customer or paid for separately. *Some services may be subject to a trip charge fee if a technician is required to come to the home. “In-Home” services are not subject to this fee, as they are already calculated to include such charges. The trip charge for our standard service area is $75.00 and may include up to one hour of labor.